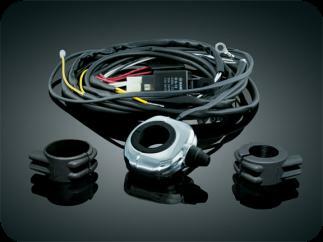 Our new Wiring & Relay Kit makes it easy to wire your new Küryakyn driving lights the right way. Eliminate the risk of overloading & damaging existing circuits on your bike by adding this independent circuit. A super-clean handlebar mounted push-button switch makes it easy to power-up your lights whenever they’re needed.